Are there any department-specific needs that must be included in the policy? Will the background checks be department, role or job specific? Which screens are necessary per job or department? When will the background checks be done, prior to or after the job offer? Will there be rolling background checks or background checks on current employees? Which background check agency will you use? Which criminal background activity will automatically disqualify a candidate? Once these questions are answered, best practices can be applied company-wide and help to manage the risk of negligent hiring, discrimination or hiring bias. After determining the type of background checks needed and when, another important procedure is a consistent practice of obtaining authorization and consent from your applicant. The Fair Credit Reporting Act (FCRA) specifies that a "clear and conspicuous" document, separate from an application, is necessary to reduce the likelihood of confusion when the form is filled out. The applicant will provide personal information such as their name, address, date of birth and social security number and they will be provided with an explanation of which background checks will be done. They will also be informed that the information found on the background checks could determine the decision to hire, promote, or terminate. Fair Credit Reporting Act (FCRA) - Federal legislation that specifies what is required to inquire about an individual's background, what rights they have, and how the information is to be used. Ban the Box - Laws that are being passed in many communities and cities across the United States to remove the criminal history question from job applications. Salary History - California, Oregon and New York City have passed laws banning salary history inquiries during the hiring process. Equal Employment Opportunity Commission (EEOC) - Established to enforce civil rights of employees against discrimination based on gender, race, religion, age, national origin and more. Criminal background checks are not the only background checks employers may be running on employees. Depending on the job, there may also be credit checks, driving record checks as well as basic identity, education and employment verification. A background check policy will define the red flags or negative information that would automatically disqualify an applicant from being hired or promoted. Criminal background checks may also reveal information that may or may not disqualify an applicant. Hiring managers must be able to reliably apply their criminal background check policy indiscriminately to any applicant. An applicant's criminal record must also be individually assessed to determine if the crime would affect the job, depending on what type of crime, how long ago it was committed and if there was a conviction. A background check decision matrix is helpful for setting up a written policy to avoid a blanket "deny all" policy to anyone with a criminal record. 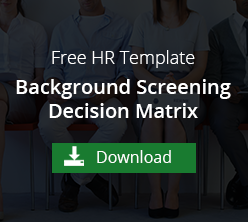 Once the background check reports have been reviewed, the human resources manager can make a decision to hire, promote or terminate employment. Before an adverse or "no" decision is handed down, however, the FCRA specifies that the applicant must know about the negative information contained in their background report and that the decision is a "no". The written pre-adverse action notice fills them in on what was found and allows them a chance to dispute the information. If there is no dispute, then a written adverse action notice informs the applicant of the adverse action and provides them with a copy of their background check report. Running a background check on employees can be a smoother, more consistent process if it's documented and applied across the organization. Negligent hiring, turnover, bad hires or discrimination typically comes down to a hiring process that is broken or otherwise ineffective. Employers can stay compliant and create a positive experience for management and employees with an HR policy for criminal background checks.